I’m Liz the lady behind Advantage In Vintage and I like old things- I mean I REALLY like old things. Gimme old clothes, old furniture even old people to chat to and I’m a happy bunny. My interest in vintage started young, blame my Mum dragging me (ok i happily went) around charity shops. In the early nineties I remember picking up beautiful 30s embroidered bags for as little as a fiver in the Surrey charity shops. Those days may well be long gone…but my time hunting in charity shops helped me develop a passion (and an eye) for all things old and beautiful. From there an obsession developed, I started wearing vintage clothes when I was around 15 and selling them when I was 17. For me it wasn’t just about the clothes themselves but the history imbued into each garment,whether this was by the original maker or the wearer. Today I have a sometimes overwhelming collection of vintage clothing. 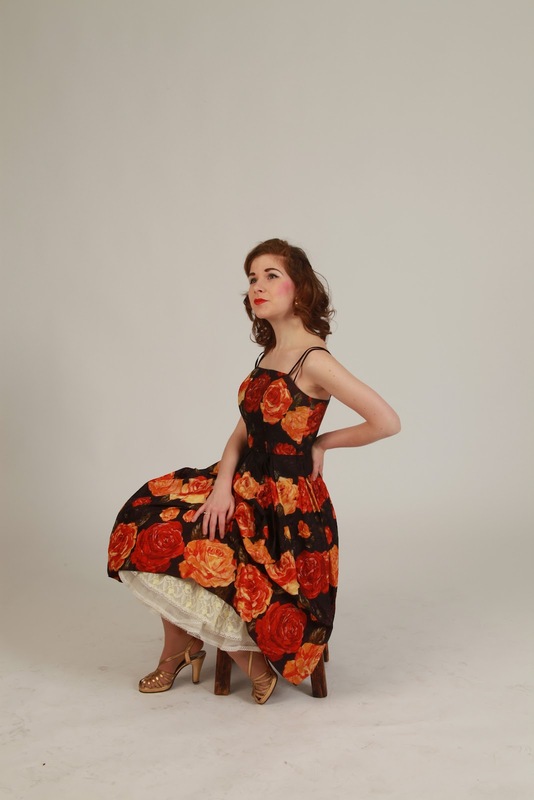 My collection primarily focuses on printed cotton garments from the 40s and 50s (I have over 70 Horrockses dresses and I’ve lost count of the number of novelty print skirts I own). Although, I can be persuaded to buy the odd Ossie Clark, Miss Mouse or Fiorucci garment. I’m lucky enough that I’ve really been able to pursue my passion further. I have a BA (1st) in Fashion Design from Leeds University and an MA in Design History from the Royal College of Art. My MA focused upon the Model House Group and Fashion House Group and the British Ready-to-Wear fashion scene between 1946-66. You can read more about my MA work here. I have also recently started my PhD at the University of Brighton focusing primarily on the work of wholesale couture designer Frederick Starke (Design star funded). Museums are one of my real loves. I’ve been very lucky that through both my BA and MA I have had the chance to work on some amazing exhibitions. In 2011 I co-curated Little Black Dress at Portsmouth City Museum and between 2013-14 I completed research towards the Alexander McQueen: Savage Beauty exhibition. I also spent nearly 3 years working for Sutton council, first as a House Assistant at Honeywood Museum and Whitehall historic house. Between October 2014 and October 2015 I was the curator of Whitehall historic house. I really enjoy writing and in the past couple of years I’ve had the chance to put pen to paper, in 2014 I completed my first book (co author with Naomi Thompson) about vintage accessories. You can read more about it here and in 2015 my first solo book- Style Me Vintage: 1940s was released. In an Islamic society Muslims are organised in both groups and strata. Weeks ago, I did a test using Alvin Phang’s Atomic Blogging Tactics and my Keyword I am targeting “Online MLM Blog” has ranked No. andd tell you I genuinely enjoy reading your blog posts. I’m just starting on your blog – I found you because of Pat Albeck on Desert Island Discs which was so interesting I decided to Google her – I hadn’t heard of her but realised I knew some of her work – cats and souvenir tea towels especially! I hope to explore your blog further. I am trying to trace the Adler family (former owners of the Matita dress company). Can you help ?